The X-T2 is one of our favourite cameras at the moment, and with the X-T20 Fujifilm has managed to distill many of these key features into a slightly more compact and affordable camera that's likely to hit the sweet spot for many photographers. Just as when it followed up the X-T1 with the X-T10, Fujifilm has taken a lot of the good stuff from the X-T2 and packaged it in a lighter, more affordable body to give us the X-T20. 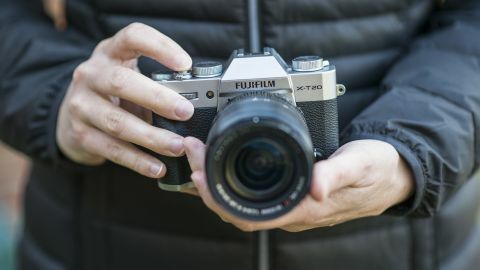 Rather than leaving a 16-month gap between launching the two cameras as it did with the X-T1 and X-T10 though, Fujifilm has hardly missed a beat, announcing the X-T20 just over four months after the X-T2. So should X-T2 owners now be kicking themselves over their purchase, or are there enough differences to separate the two? Just as we’ve seen with the X-Pro2 and X-T2, the X-T20 incorporates Fujifilm’s latest 24.3MP X-Trans CMOS III APS-C sensor. It delivers a significant boost in resolution from the X-T10’s 16.3MP sensor, and brings the new camera in line with pretty much most of its competitors. The ISO range gets a boost as well, with a native sensitivity range of ISO200-12,800, compared to ISO200-6,400 on the X-T10, and while the expanded range stretches to the same sensitivity limits of ISO100-51,200, there’s some welcome news here too – unlike on the X-T10, where the expanded range was restricted to JPEG-only files, the X-T20 allows you to shoot raws as well JPEGs at this expanded range. The X-T20 sticks with the same 2.36 million-dot OLED electronic viewfinder as we saw on the X-T10. Interestingly, while the resolution matches that of the EVF used in the X-T2, the magnification isn’t quite as impressive, at 0.62x compared to 0.77x, and not quite a match for the Lumix G80/G85’s 0.74x magnification. While the X-T2 did away with a touchscreen interface at the rear – at the time Fujifilm believed, after feedback from users, that there wasn’t a demand for it – it seems to have had a bit of a change of heart for the X-T20. The X-T20’s 3.0-inch touchscreen doesn’t quite offer the same breadth of control as, say, the one on the Canon EOS M5 or G80/G85 though, limiting you as it does to tapping the display to acquire focus and trigger the shutter, in addition to pinching to zoom when reviewing images; if you’re hoping to be able to toggle and adjust controls on the rear display you’ll be left disappointed. Resolution receives a boost over the X-T10, increasing from 920k-dots to 1.04m-dots, matching that of the X-T2. Unlike the X-T2, the X-T20’s display doesn’t take advantage of Fuji’s double-jointed design, but the mechanism still allows you to pull the display outwards for waist-level shooting, and downwards should you want to use the camera raised aloft. The X-T20 also comes equipped with Fujifilm’s X-Processor Pro imaging engine, which sees it spring into life a little quicker than the X-T10 at 0.4 seconds, while the shutter lag has been reduced to 0.05 seconds. There’s just a single SD card slot on the X-T20, compared to the X-T2’s two, while it doesn’t support UHS-II cards. The X-T20 offers 4K video capture (3840 x 2160) at 30p as well as Full HD (1920 x 1080) at 60p, both of which support film simulations as well. There’s an input for a microphone, but not for audio monitoring.